Smarti stands for Sales. Marketing. Advisory. Resources. Talent. Integration. The name is about what we do for businesses, and that helping them prosper with marketing strategy, business development and agency selection. Our smarts don't go to our heads - they go to your business. For over 18 years, Smarti has managed and sourced marketing service for everyone from fast growing entrepreneurs to established global companies across industries spanning fashion to financial, restaurants to real estate, legal to luxury, travel to technology, farming to pharmaceuticals and more - to the raves of clients. The "Agency Authority", Smarti provides a time-saving and cost-effective way for clients looking to partner with qualified marketing agencies in the areas of creative, advertising, digital, public relations and more. Smarti Solutions is led by Michele Harris, a seasoned marketing and business development expert with over 25 years' experience developing revenue-rich marketing programs for F500, early stage companies and marketing agencies. In 2001, Michele founded Smarti Solutions, a leading agency selection firm for the mid-size marketplace. Michele has managed hundreds of reviews for advertising agencies, public relations firms, branding, digital, experiential, media and marketing companies, across a broad range of industries saving time and turmoil for both clients and agencies. Prior to Smarti, Michele was Vice President of Marketing & Business Development at agency Lowe Lintas, where she managed channel alliances and spearheaded new business development initiatives including HSBC, BlueStreak and various Unilever brands. Earlier, as Director of Business Development at Blue Marble ACG, Michele co-formed the agency's marketing consulting group and landed multi-million-dollar clients like Cadillac, Medscape & Nabisco-in addition to leading all business development initiatives with sister agencies N.W. Ayer and D'Arcy. Other agencies where Michele has managed client services include K2 Design and Dentsu Advertising and K&L Partners. Michele has developed national advertising, online and field marketing programs for major brands ranging: Procter & Gamble, Cadillac/GM, Hewlett Packard, Bayer, CIBC Oppenheimer, TDWaterhouse, Audio Book Club, Standard and Poor's, Canon USA, Japan Airlines, Hill's Pet Nutrition/Colgate Palmolive, Castrol and Perrier. Michele has been covered by Media Post; PR Week; Crain's BtoB Magazine, CNN Money Magazine, The New York Times, U.S. News & World Report, The New York Post and Inc. Magazine and received a Small Business Award from Mayor Bloomberg. ​She received her B.A. in Communications from George Washington University. ​Can your heart and wallet resist these tactics? 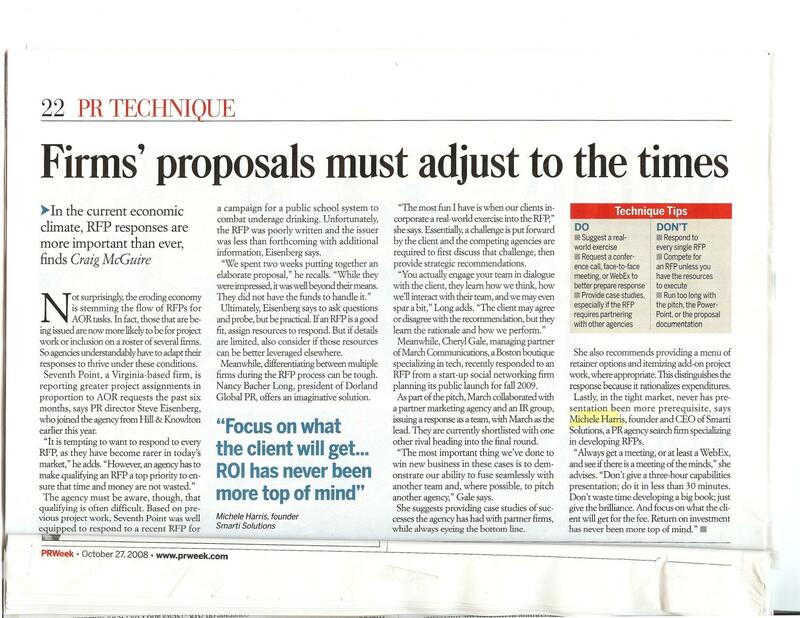 ​If you ever get the opportunity to help a client pitch venture capital funders, go for it. The experience and feedback are priceless. ​Marketers are being more selective about the agencies they work with and how they work with them. 12/19/08 - Better Entrepreneur: Who was the better entrepreneur, Bruce Wayne or Tony Stark? Which company was better, Wayne Enterprises or Stark Industries? ​"Teeth-whitening woke everyone up and set the platform for new products and innovation. Along with that comes the need to differentiate and brand yourself." 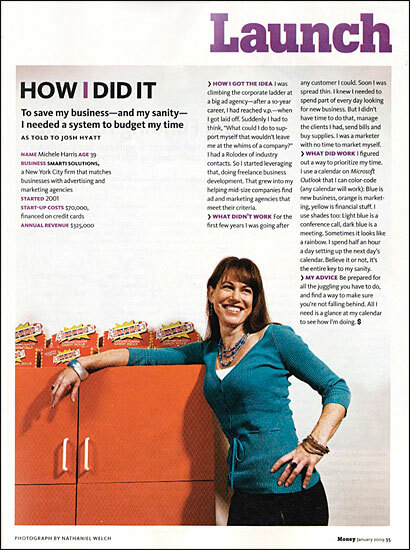 1/07 - How I Did it - To save my business - and my sanity - I needed a system to budget my time. Be prepared for all the juggling you have to do and find a way to make sure you're not falling behind. 3/9/06 - Award-Winner Smarti Solutions Honored by NYC Mayor's Office - Only marketing firm recognized. Smarti Solutions has been selected to receive a Small Business Award as one of 16 small businesses in New York City that "shape, serve and improve the lives of women".